Wizards of the Coast intends to release its latest Dungeons & Dragons rules after two years of public testing. Tabletop roleplaying may have grown exponentially in recent years, but in the end, it always comes down to Dungeons & Dragons. This game has been so influential that all other RPGs, regardless of genre, are ultimately judged against its d20 standard. Not even the reviled Dungeons and Dragons Fourth Edition could change that, despite a knack for driving fans to alternatives like Pathfinder or Dungeon World. Regardless, Wizards of the Coast wants to bring players back to D&D, and hopes its latest edition can do just that. 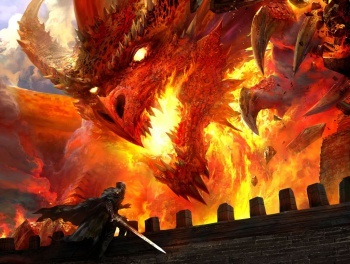 After two years of testing, including an open beta, WotC has announced that its latest Dungeons & Dragons rules will officially launch in Summer 2014. "Just like a perfectly balanced party, Wizards has worked cohesively with fans, designers and partners to create the next generation of D&D," said Dungeons & Dragons Brand Director Nathan Stewart. "We whole-heartedly thank all of the play test participants, whose feedback has proven instrumental in shaping the future of Dungeons & Dragons." Dungeons and Dragons Fourth Edition wasn't a bad game in and of itself, but it was dramatically different than what most players had expected. Today, with a new emphasis on playtesting, feedback, and compatibility with previous editions, Wizards of the Coast likely hopes these rules will unite D&D's fractured base. Assuming the publisher hasn't rolled a critical fail along the way, we'll find out in about six months.